Encourages proper ergonomics and reduces fatique with this cushioned standing mat. 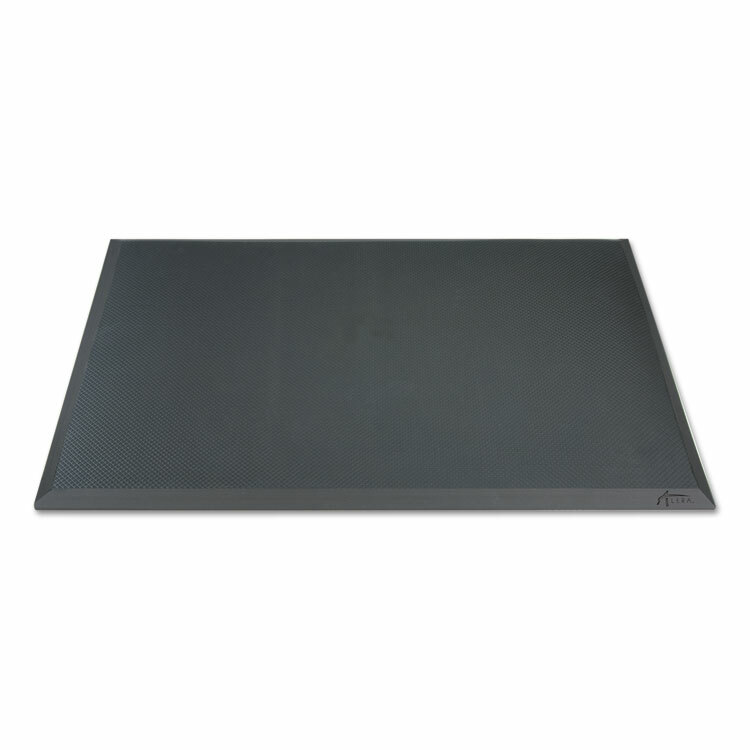 Beveled edge lays flat on the floor to reduce trip hazards. Rubber and vinyl construction ensures long lasting resiliency and cushioning. Ideal for use at sit-to-stand workstations, service counters, breakrooms, or where ever standing is required. Easy to clean surface with molded grid pattern to catch dirt and spills. Combine with Alera® ActivErgo Height Adjustable Tables or Alera® ActivErgo WorkRise Lifting desks for even more ergonomic benefits with your sit-to-stand workstations. Mat Type: Anti-Fatigue Mat; Application: Sit-to-Stand Desks; Material(s): Synthetic Rubber; Style: Rectangular. Encourages proper ergonomics and reduces fatique with this cushioned standing mat. Rubber and vinyl construction ensures long lasting resiliency and cushioning. Ideal for use at sit-to-stand workstations, service counters, breakrooms, or where ever standing is required. Easy to clean surface with molded grid pattern to catch dirt and spills. Combine with Alera® ActivErgo Height Adjustable Tables or Alera® ActivErgo WorkRise Lifting desks for even more ergonomic benefits with your sit-to-stand workstations.